BEWARE: New taxi modus operandi exposed! Home / news / photo / viral / BEWARE: New taxi modus operandi exposed! 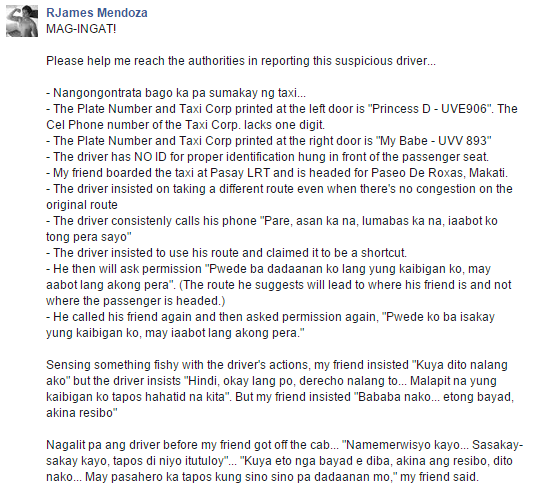 In a Facebook post that has gone viral on social media, netizen RJames Mendoza warns commuters of a new modus operandi involving a taxi driver. "My friend got off at Buendia and the taxi fare was already at PHP 150.00. UPDATE: As of the moment [April 23], Ms. MARIVIC LANGIT, Secretary of My Babe Taxi Corp. is already coordinating with us to resolve the issue. They are inviting us to meet their driver and inspect their taxi unit to prove that the allegations were wrong. Unfortunately, for now, we are still waiting for the response to the email we sent LTFRB and LTO. We are calling on these two authorities to mediate during the investigations so that we can also be assured protection should we meet with the involved driver and the Taxi Company where he is currently employed." Share this to people who matter to you most. You might save someone's life by doing so.